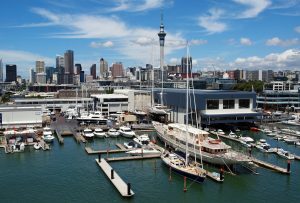 Auckland’s Orams Marine and the city’s redevelopment agency, Panuku Development Auckland, have reached an agreement which will see a comprehensive marine facility built in Wynyard Quarter. A much-anticipated and oft-debated marine facility has been given the green light today as Orams Marine and Panuku Development Auckland announced they’d reached an agreement. The area known as Site 18 will be developed into a facility capable of hauling out and servicing large vessels up to 620 tonnes, and allowing New Zealand to grow its market share in this sector. The NZ Marine industry has welcomed the news, forecasting greater apprenticeship numbers, an increase in jobs and the ability to take full economic advantage of having the America’s Cup in local waters. Limited facilities in New Zealand for adequately hauling out vessels of this size means local companies are regularly turning away work due to lack of space to haul the vessels out of the water. With the knowledge that the market is already there; the marine industry is buzzing to now be able to take advantage of it. Orams plans to complete the marine elements of the site in time for the next America’s Cup in early 2021 in order to take advantage of the influx of commercial and spectator vessels which will arrive with the regatta. “This move is a step towards a longterm strategy the marine industry has held dating back to 2000,” says NZ Marine Executive Director Peter Busfield. That strategy was to retain parts of Wynyard Quarter to create a concentrated marine precinct crucial to New Zealand’s overall marine sector. Deepwater access to the sites, coupled with proximity to logistical needs and the business which Auckland attracts, makes the area unique in New Zealand for hosting a thriving marine precinct. “The Orams Site 18 project will further enhance our capability of providing quality refits and maintenance on the world luxury yacht market,” adds Orams Marine Services Managing Director, Craig Park. Orams Marine, led by Neven Barbour and Park, has put significant effort into creating a hub which adds sustainable value to the wider Auckland economy, alongside its positive injection into the marine industry. The new facility is predicted to produce 500 new jobs and significantly decrease the number of opportunities which are lost to competitors offshore. Vessels the facility will be able to service will include fishing vessels, ferries, commercial vessels and superyachts.